Despite a loss to the Lightning, Prior Lake will get a first round home game as they try to return to the state tournament. A goal line stop and an interception returned for a touchdown doomed the Lakers as they fell to Eastview 28-14 Oct. 17 at Dan Patch Stadium. The first key play of the game came on the Lakers second drive of the game. After a 38 yard pass from quarterback Colin O’Connor to wide receiver Spencer Marlier advanced the ball into Eastview territory, the Laker offense faced a fourth-and-one at the 33-yard line. O’Connor took the snap and gave the ball to running back/linebacker Spencer Shaver, who was met in the backfield by multiple Eastview defenders, ending the drive. The teams traded defensive stops until late in the first quarter when Eastview started with the ball just across midfield at the Laker 49-yard line. The Lightning went on an 8-play drive that continued into the second quarter, capped by a 22-yard touchdown pass from quarterback Erick Reimann to tight end Tate Machacek to give the Lightning a 7-0 lead with 9:49 left to go in the first half. Prior Lake responded quickly. Starting from their own 33-yard line after the kickoff, O’Connor started the drive with a 14 yard run to get out near midfield. O’Connor then completed back-to-back 15 yard passes, one to receiver Kyle LeGrange and another to cornerback/receiver Jackyse Jacox. On the very next play, running back Keaton Schroeder took the handoff from O’Connor and ran around the right edge, all the way into the end zone for an 18-yard touchdown. Kicker Mike Nelson’s extra point was no good, making the score 7-6 Lightning with 8:02 left in the half. The Laker defense stood tall and forced a three-and-out on the next drive. The Prior Lake offense then started what would end up being a methodical 17-play drive. The Lakers converted on a pair of third downs on the possession and eventually had first-and-goal at the 3-yard line in the closing minute of the half. After an incomplete pass on first down and a run for a yard on second down, O’Connor took the snap and tried to follow his blockers to the right but he was met by Eastview defenders on about the 1-yard line before he could reach the pylon. Prior Lake then ran the clock down so the fourth down snap would be the final play of the half, O’Connor took the snap and tried to push his way up the middle and into the end zone but the officials marked him short of the goal line, resulting in the Lakers coming up with nothing and the Lightning taking a one-point lead into halftime. On the third play from scrimmage in the third quarter, Reimann connected with running back Isaiah Misukanis on a deep crossing route on a third-and-4 for a 42-yard gain. A few plays later, Eastview advanced the ball inside the 10-yard line and Misukanis ran it in from 5 yards out for an Eastview touchdown, extending their lead to 14-6 with 8:28 to go in the third quarter. Another key play happened on the next drive. With the Lakers facing a third-and-7 at the Eastview 43-yard line, O’Connor took the snap, dropped back and threw a screen pass to Schroeder but the ball was picked off by linebacker PJ Swanson and returned for a touchdown. The score pushed the Eastview lead to 21-6 with 5:43 to go in the third quarter. Things weren’t much better for the Laker offense on the next drive as Shaver fumbled on the fourth play, giving the ball back to the Lightning. Eastview completed a pair of 10+ yard pass plays and ultimately got the ball down to the Laker 4-yard line where running back Quintcy Suggs scored the final Eastview touchdown on a toss play, increasing the lead to 28-6 with 1:51 to go in the third quarter. The Lakers scored their final touchdown in exciting fashion. With the Lightning facing third-and-long at the Laker 40-yard line, Reimann tried to connect with a receiver down the middle of the field but safety Nick Larson intercepted the pass, weaved his way through potential tacklers and followed his blockers all the way to the end zone for a 77-yard touchdown return. The two-point conversion try was good on a connection between O’Connor and LaGrange to cut the lead to 28-14 with 4:59 to go. Nelson’s onside kick could not be recovered by the Lakers but the Prior Lake defense forced a punt, giving the offense one final chance in the closing moments. Prior Lake got the ball to the Eastview 41-yard line but threat ultimately ended on an incomplete pass intended for Marlier at the goal line that would have been a touchdown catch but the officials said the ball hit the ground. Eastview then ran out the clock to claim a 28-14 win. O’Connor led the Lakers in both passing and rushing. He completed 15 of 31 passes for 163 yards and three interceptions. He also rushed for 111 yards on 22 carries. Marlier was the leading receiver with eight catches for 81 yards. Safety Austin Gordon led the Laker defense in tackles with 10, while linebackers Noah Benson and Michael Herbst had eight and seven respectively. 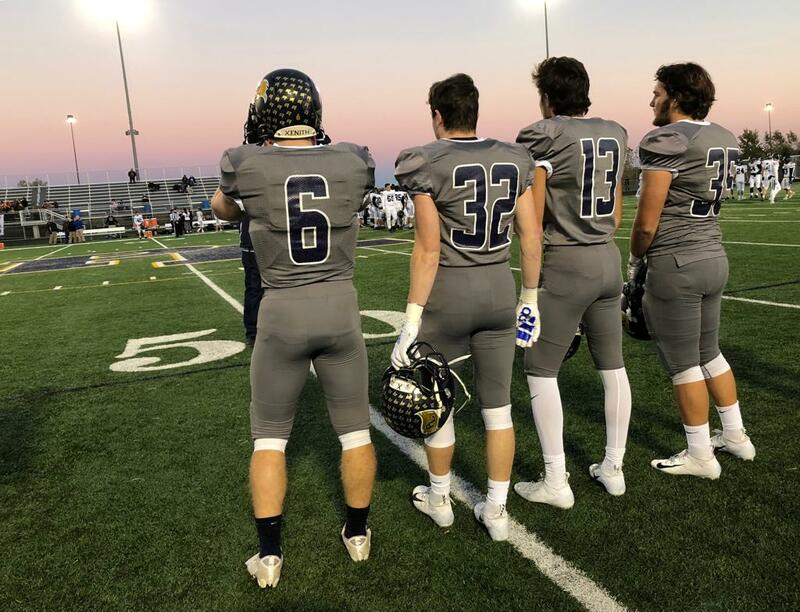 Prior Lake was voted the 4 seed by the Class 6A Section 3 coaches and will host Buffalo in the first round of the playoffs Oct. 26 at Dan Patch Stadium. The Lakers (4-4) and the Bison (6-2) haven’t played each other since 2007, a 23-9 Bison win at Prior Lake High School. This year’s Bison team, ranked tenth in the final Class 6A rankings released Oct. 23, is coached by former Vikings and Packers quarterback Todd Bouman. The Lakers were not ranked in the top 10 of the same poll. Buffalo was awarded the 5 seed in Class 6A Section 6, the best seed the program it has ever gotten in a section that includes the likes of Eden Prairie, Edina, Minnetonka, Wayzata and Shakopee. Buffalo enters Friday’s matchup on a hot steak having won six games in a row, with their last loss coming to perennial Class 5A powerhouse Elk River. Uniquely, the Bison play all their regular season games against 5A schools before coming up to 6A for the playoffs. Buffalo has arguably one of the most explosive offenses of any team in the state, averaging 49.1 points per game. The Bison offense is led by quarterback Aidan Bouman, who is coach Bouman’s son and an Iowa State commit. The younger Bouman currently leads the state in each of the three major passing categories with 208 completions for 2,974 yards and 35 touchdowns. Buffalo also boasts two of the top receivers in the state in Treyton Welch and Jack Munsterteiger. Welch has had offers from Wyoming, North Dakota State, South Dakota State, Northern Iowa and others. He is currently leading the state in receiving yards with 1,032, third in catches with 60 and third in touchdowns with 13. Munsterteiger ranks second in the state in both receptions and receiving yards with 61 catches for 994 yards to go with 10 touchdown receptions. The Bison’s ground game is no slouch either, led by running back Riley Habisch, who has rushed for 1,303 yards on 175 carries and 18 touchdowns this season. The winner between the Lakers and the Bison will take on the winner of top seeded-Blaine and eighth-seeded Totino-Grace on Nov. 2 with the high seed hosting. Kickoff against Buffalo on Friday is scheduled for 7 p.m. at Dan Patch Stadium. Be sure to check back next week for a recap of the Buffalo game and (if the Lakers advance) a preview of the Round 2 matchup.